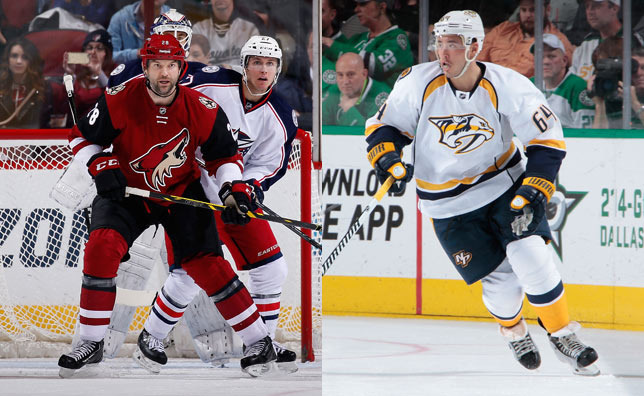 MONTREAL– Montreal Canadiens general manager Marc Bergevin announced Friday the acquisition of defenseman Victor Bartley and forward John Scott from the Arizona Coyotes, in return for defenseman Jarred Tinordi and forward Stefan Fournier. Bartley and Scott will both join the Canadiens’ AHL farm team in St. John’s. Bartley, 27, appeared in one game with Nashville this season, totaling two hits and five blocked shots. He added one assist and 10 penalty minutes in 14 games with the AHL’s Milwaukee Admirals. The 6’0’’ and 215 lb defenseman has posted 23 points (1 goal, 22 assists), 55 penalty minutes and a +2 differential in 112 career regular season games in the NHL. In 162 career games in the AHL, Bartley has collected 68 points (18 goals, 50 assists) and 121 penalty minutes. A native of Ottawa, Bartley, acquired earlier today by the Coyotes, first joined the Predators on May 24, 2011 as a free agent. A product of the WHL’s Kamloops Blazers and Regina Pats, he recorded 168 points (36 goals, 132 assists) in 336 games at the junior level. Scott, 33, has registered one assist, 20 hits and 25 penalty minutes in 11 games thus far this season with Arizona. The 6’8’’ and 260 lb forward has posted 11 points (5 goals, 6 assists) and 542 penalty minutes in 285 career regular season games with the Minnesota Wild, Chicago Blackhawks, New York Rangers, Buffalo Sabres, San Jose Sharks and Coyotes. A native of Edmonton, Scott joined the Coyotes on July 10, 2015 as a free agent. A product of the WCHA’s Michigan Tech Huskies, he totaled 19 points (7 goals, 12 assists) in 126 games at the collegiate level. The 23-year old Jarred Tinordi registered five penalty minutes in three games with the Canadiens thus far this season. He also added two assists in six games with the IceCaps. The Burnsville, Minnesota native was the Canadiens’ first round pick, 22nd overall at the 2010 NHL Entry Draft. The 23-year old Stefan Fournier produced seven points (5 goals, 2 assists) and 65 penalty minutes in 24 games with St. John’s thus far this season. The Dorval, Quebec native added one assist and 19 penalty minutes in five games with the ECHL’s Brampton Beast. Fournier first signed a contract with the Canadiens as a free agent on July 6, 2013.